Tish Higginbotham arrives on the back of a motorbike. TISH Higginbotham knows how to make a 90th birthday memorable. The Mundaring resident turned up on the back of a motorbike to celebrate the occasion with friends at a Darlington cafe. The sprightly senior said the birthday was the most memorable one yet and took her several days to get over. Tish retired to Australia from England 18 years ago and last remembers being a pillion passenger about 30 to 40 years ago. And she would do it all again, but there are other must-dos in life on her list. Next year’s birthday is likely to be celebrated in mid-air under a hot-air balloon. Tish is an active member of the Hills social group Wheels Inc, started about six years ago by Sally Roberts, of Mahogany Creek. Sally (67), a motorcycle enthusiast, provided the wheels to take Tish to her birthday gathering. 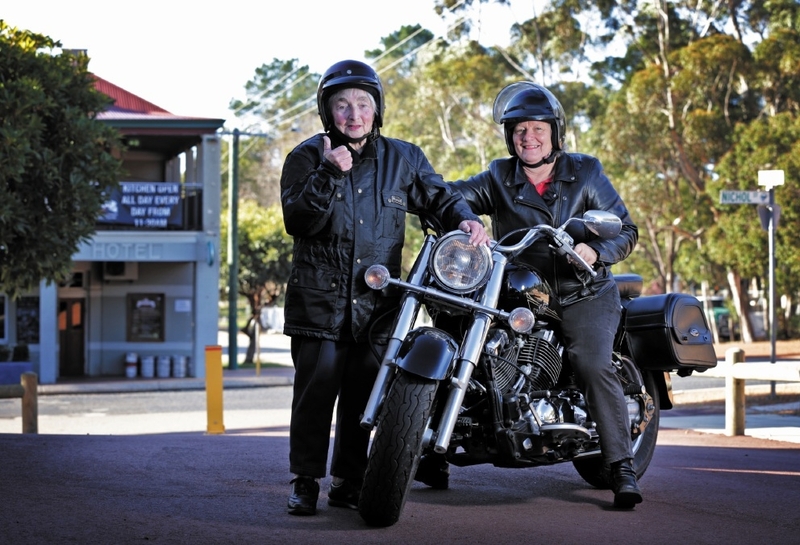 “I had a motorbike when I was younger and when I retired I thought, why not?” Sally said. Wheels Inc has more than 30 members and offers friendship and outings to people aged 55-plus. “I started the group because people living in the Hills can feel really isolated,” she said. For those without wheels, there is a minibus pick-up and members ensure no-one misses out. Tish said it was important to get out and about later in life and to have friends. “You don’t have to be interested in everything offered by the group, you can pick and choose what you do,” Tish said. For more information about Wheels Inc, contact Sally at wheels_inc@sky mesh.com.au or 04231 78 266.